Check out this new marketing video on Opera.com , with base jumping . The marketing like the previous surfing videos is very cool IMHO. It is the new generation of Opera based on Chromium instead of the previously opera homebrewed Presto engine. 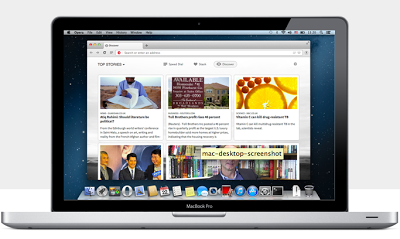 To be exact the new Opera is based on the Blink browser engine flavor of webkit. Most people in the tech press seem to not know what to make of it, because of how minimalist (e.g. no baked in email client in the browser) , clean and simple it is. Right now it seems like the majority of the tech press are having a hard time telling the difference between Chrome proper and Opera 15. Of course Opera has added its unique flavor to chromium: Discover, Stash, Speed Dial (with folders) etc. The really really exciting news i think is for extension developers. Opera 15 runs Chrome extensions. Not if you go to the chrome store (because google detects the OPR 15 User Agent signature and does not serve the chrome extension download) . However if you take an extension and drag it to your desktop then drag that extension into Opera 15 it runs !! This is a HUGE deal for Chrome extension developers. If you make Chrome extensions you now will be able to tap into Opera desktop's 40 million monthly users. Very exciting.